The Rega company began life in 1973 with the release of the Planet turntable, an unusual design that featured 3 outriggers to support the record instead of a traditional platter. In 1975 this was replaced by the classic Planar 2 turntable which made Rega's name with its blend of good performance and low retail price. The Planar 3 with heavier plinth and thicker glass platter followed in 1977. Rega's early turntables originally came fitted with Acos built tonearms, but in 1983 the first RB (Rega Britain) arm appeared in the shape of the critically acclaimed RB300 and it soon became one of the best selling tonearms in the world. Not strictly speaking a Rega arm, the Acos-Rega was fitted to the early 'Planet' turntable and is the basis for the geometry on all later arms. Manufactured in Japan it shares much in common with OEM arms fitted to countless turntables in the 1970's, featuring a removable SME-type headshell, sliding counterweight, lateral balance weight and dial-type anti-skating adjustment. The RB100 is Rega's entry level arm, fitted as standard to the P1 turntable. Distinguishing features include the simple machined aluminium arm tube with bonded headshell, Goldring GR1 style three-point arm base fixing, plastic rear stub and black counterweight. As on the RB250, VTF adjustment is a simple arrangement where the weight is turned 180 degrees for 1gm of tracking force. Anti-skating bias is magnetically applied via a plastic, sliding knob behind the arm holder and VTA is non adjustable. 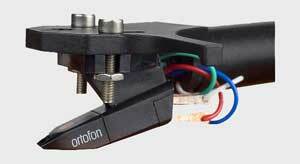 An interesting feature is that with the standard Ortofon OMB 5E cartridge fitted, the correct tracking force of 1.75gm can be applied by simply rotating the counterweight fully forward on the stub. Standard fitment on the RP1 turntable, the RB101 is Rega's new entry level arm and replaces the RB100. An unashamedly budget offering, it is remarkable value for money at a retail price of less than £100. VTF is applied by turning the counterweight on the shaft; each half turn is equivalent to 1gm of tracking force. The bias control knob was identical to that on the RB300 but later models use plastic instead of metal to cut costs further. The RB251 is the replacement for the venerable RB250 tonearm and will be standard fitment on new P2 turntables. 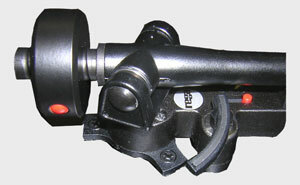 The arm still uses the plastic rear stub, steel weight and bias slider of the RB250, but now features a variant of Rega's 3-point fixing on the base. The RB300 was introduced in 1983, the long awaited replacement for the Acos derived R200 and the first tonearm to be manufactured at the Rega factory. The arm features a beautifully cast one piece arm tube and headshell, closely toleranced bearings, rigid bearing housings and magnetic frictionless bias compensation. 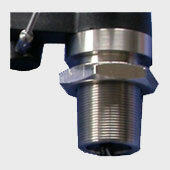 VTF is applied by a dial on the side of the vertical pivot housing. A spring within the mechanism applies maximum negative VTF at the zero setting and above three grams the spring is effectively disconnected. Wiring is slightly unusual in that the arm tube is grounded via the left channel ground wire so there is no earth wire to connect back at the preamp. External cabling is bonded to a plastic plug in the arm base and is not user replaceable (unless the user has a soldering iron!). The RB300 can be identified by the combination of black arm tube / silver counterweight and the large VTF adjuster on the side of vertical pivot. Early models where fitted with a dense (but expensive) tungsten counterweight which was later replaced by a cheaper (and larger) stainless steel counterweight. The tungsten weight is still available as an upgrade from Rega. The arm stub and lateral bearing housing are both made from stainless steel. Unlike the RB250, the RB300's vertical bearings are supported on just one side of the bearing housing to make room for the VTF adjuster on the opposite side. External wiring is slightly higher quality than that on the RB250. Internal wiring is identical. Standard fitment on the new P3-24 turntable, the RB301 is an evolution of the original RB300 tonearm. The armboard mounting now uses a 3-point configuration similar to that of the RB100 tonearm and the bias housing and phono cable are taken from the RB700. The counterweight is the later stainless steel variety and VTA is adjustable using shims. 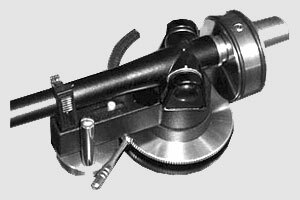 The RB600 was basically a higher specification version of the RB300 tonearm designed for use on the P25 anniversary turntable. Manufacturing tolerances where reportedly higher and the tonearm cable was Klotz GY 107, fitted with Neutrik phono connectors. The arm can be identified by the silver finished arm tube as opposed to the black finish on the RB300. Production was discontinued with the release of the RB700. The RB700 is the replacement for the RB600 tonearm and is fitted as standard to the P5 and P7 turntables. The arm tube has a newly developed coating and the bearing housing has been redesigned and tolerances improved. At the base of the arm there is a new bias adjuster similar to that on the RB1000 and a rigid stainless steel 3 point mounting block. 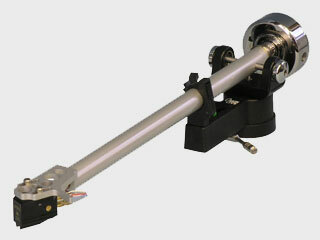 One time flagship Rega tonearm designed for the high end P9 turntable. The RB900 is similar to the RB600 but has higher specification bearings, improved finish and a rigid 3 point mounting system. The RB1000 is the replacement for the now discontinued RB900 tonearm and benefits from more stringent quality control, top quality finish and improved bearing specifications. The arm tube is polished aluminium with no external coating applied, wiring is a continuous run from cartridge tags to phono plugs and a new style rotary bias control is present. The base has a 3 point stainless steel mounting block. 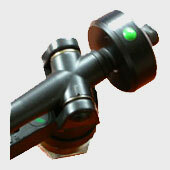 Unusually for a high end arm, vertical tracking angle is only adjustable via the use of optional shims. The RB250 and RB300 tonearms are also available as OEM (original equipment manufacturer) parts, either as part of a turntable package or as a replacement tonearm. Some are simply rebadged arms manufactured at the Rega factory, whilst others are extensive reworking's incorporating new or remanufactured parts. Origin Live's Silver tonearm and Michell's TecnoArm are both good examples of this trend where the basic RB design has been modified to offer high end performance. 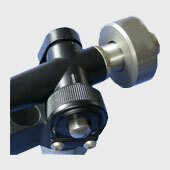 It's often said that Rega's OEM arms are built to lower standards than Rega branded arms. 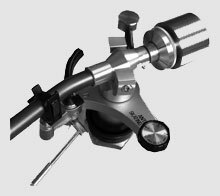 While this may be true of the Goldring GR1 arm, which is not an RB250 clone but a completely different product (although still manufactured by Rega), OEM distributors on the whole claim that the OEM 1 and OEM 2 tonearms are built to the same tolerances and on the same production lines as Rega's versions of the arms. Rega appear unwilling to confirm or deny this, but I have noticed little difference in quality across the various brands of RB250/300 I've encountered, although this does not mean that there aren't problem arms out there. 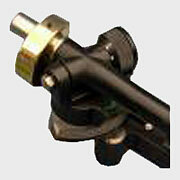 This is the tonearm fitted to the GR1 and GR1.2 turntables. It is virtually indistinguishable from the RB250 apart from the plastic 3-point screw fixing at the base. The arm tube, vertical bearing housing and counterweight appear identical to the RB250 (but with black markings instead of green) although bearing quality is reportedly to a lower specification to reduce costs (In the UK a complete GR1 turntable package costs the same as an RB250 tonearm). Of the two GR1 arms that I've encountered, both had a small amount of play in the vertical bearing assembly which was quickly rectified by readjusting the set screws. As the screws had been fitted securely with loctite I can only presume they had been set like this at the factory. I'd definitely recommend a bearing adjustment check as the difference in performance isn't small. Standard fitment on Goldring's GR2 turntable, this arm is similar to the OEM1 but comes with gold plated phono plugs on the output cables. Mounting is via a threaded brass stem as found on the RB250 rather than the plastic 3-point base on the GR1/1.2 turntables. 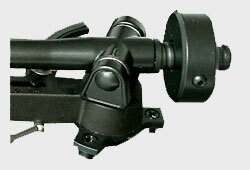 For this tonearm Origin Live took an OEM 1 base and added their own arm tube, headshell and counterweight, with vertical bearings moved from the arm to the yoke. All wiring is replaced by OL's own cable. The arm tube is bead blasted to harden the surface and a series of holes drilled into the underside to disperse structural resonance's and reduce weight. The arm tube is then filled with foam to further reduce resonance's; The headshell is machined flat to ensure accurate azimuth in relation to the bearings; The arm is wired with single runs of silver litz from silver plated cartridge tags to silver plated phono plugs; A Michell TecnoWeight is fitted in place of the standard plastic stub / steel counterweight; A Michell VTA adjuster is fitted to the base; Following reassembly the arm bearings are readjusted to ensure optimum adjustment. In standard trim the RB series of tonearms provide remarkable value for money. However, with a few simple modifications even the lowly RB250's performance can be improved to that of much more expensive designs. Popular upgrades include replacement of the stock wiring and counterweight and the addition of VTA adjustment (something that even the RB1000 lacks!). Many of these modifications can be safely attempted at home but may require competence at soldering and a variety of hand tools. 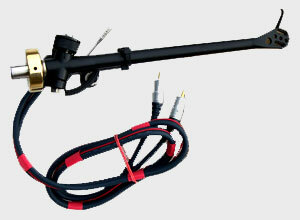 If in doubt contact a dealer to do the work for you; tonearms are precision instruments and require careful handling. Also note that any modification will void your remaining warranty. On the RB250 and RB300 the external cable is fairly low grade and is fitted with cheap, plastic bodied phono connectors. Internally the wiring is moderately flexible but the arm ground is joined to the left channel signal ground. This provides an adequate solution to hum in most circumstances but any RFI is introduced into the signal path (not ideal) and some preamps, including those with balanced inputs, may not prove compatible. Removing the link between the arm ground and signal cable should be a top priority and a separate earth cable can easily be added during a rewire. You can also choose whether to replace the wiring with a single run from cartridge tags to phono plugs, have a soldered connection to upgraded external wiring or add a standard JIS (DIN style) socket to the arm for use with aftermarket cables. For an improved earth contact see Audio Origami's webpage for details of his brass contact ground conversion. If you aren't proficient at soldering very thin wires and are worried about routing the new cable through the tonearm (this can lead to increased friction and mistracking), several companies now offer rewiring services at reasonable cost. 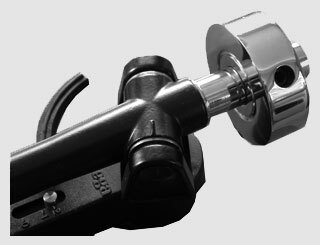 Made to order custom counterweights for any tonearm with either dropped weight for lower centre of gravity or standard profile. All weights come with grub screw fixing for secure fastening. Available in highly polished brass or gold plated finish. Standard fitment on the Michell TecnoArm, the Tecnoweight is also available as a DIY kit. The kit includes a new end stub that fastens in a similar way to the original Rega item but is hollow and has a threaded portion at the end. It comes complete with two weights for cartridges weighing from 3 - 13g and an integral stylus balance with 0.1g divisions. The design of the weight not only increases rigidity by the addition of allen screw fixing, it also lowers the centre of gravity of the weight so that it is in line with the cartridge. In theory this helps when tracking heavily modulated records as the tracking force will remain constant as the arm rides the waves. The weight also sits closer to the pivot point helped by the hollow stub and lightweight aluminium rear adjuster. 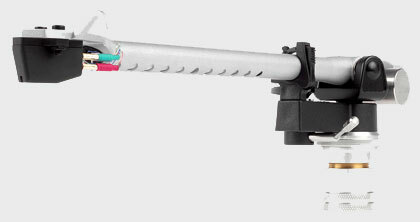 This should lower the arms effective mass and improve its compatibility with higher compliance cartridges. The Origin Live structural upgrade is an extremely popular conversion that has been updated numerous times since its introduction. The kit comes complete with a two-part chrome plated stub that is fastened to the arm using a high tensile bolt for maximum rigidity. The counterweight itself has a special internal profile which means that when it is tightened down it 'grabs' the stub like a chuck in a lathe for a very rigid attachment. "The new stub is designed to present a low contact area with the arm tube. 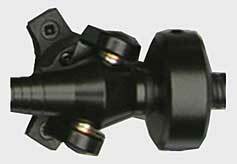 It is therefore semi-decoupled, yet far more rigid than the original"
Vertical tracking adjustment (VTA) is only possible on Rega arms by addition of shims under the arm base. 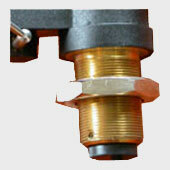 To enable more accurate adjustment a range of sleeves are available which screw onto the Rega mounting stem. Relatively new to the market is the VTAF base by Pete Riggle Audio which allows not only 'on the fly' adjustment but also decouples the arm from the plinth. The 'Easy Rider' from Incognito is a thin walled, solid turned aluminium sleeve that raises or lowers the arm by one millimeter for every turn and is designed to fit standard Rega decks with no modification. 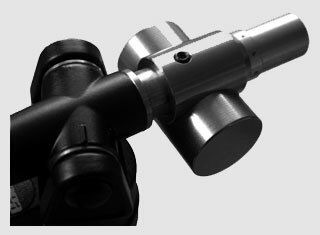 Fitted as standard to the Michell TecnoArm, this VTA adjuster is also available with optional finger nut for rapid adjustment. The required hole size is 1 1/8" and minimum height added by the collar 1.75mm. Smooth and easy adjustment of VTA on the fly; Continuously variable VTA adjustment... infinite resolution; High resolution: Each full turn of the adjuster wheel results in only .025 inch (0.635mm) height changes; VTA is easy to measure, record, and reset. The standard powder coating on Rega arm tubes has been shown to have a slight over dampening effect when used in revealing systems. Rega overcame this on the RB1000 by specifying a polished finish instead of paint and it has proved a popular modification on Regas standard arms. This an optional procedure which can be done at the same time as a rewire. The powder coating is removed and the arm tube highly polished (as per the high end RB1000 tonearm). The bearing carrier can also be polished for a matching finish. The Origin Live slotted arm tube combines the highly polished finish of the Rega RB1000 tonearm with resonance reducing holes of the Michell TecnoArm. "The upgrade involves removing the powder coat from the arm tube which enables faster energy transmission and prevents the arm being over damped. A slot is then machined in the underside of the arm to reduce ringing effects. Lastly the arm tube is highly polished giving it a very high grade appearance"
Posted Thu, 09/10/2009 - 16:12 by kennedykr. Caveat emptor: I mistakenly purchased a new Moth OEM Arm 2 under the impression that I was getting an OEM RB300. The Arm 2 does have the better tungsten counter weight and metal arm stub.